(a) The vehicle must be unloaded before jacking up / lifting up the vehicle. Never jack up / lift up a heavily loaded vehicle. 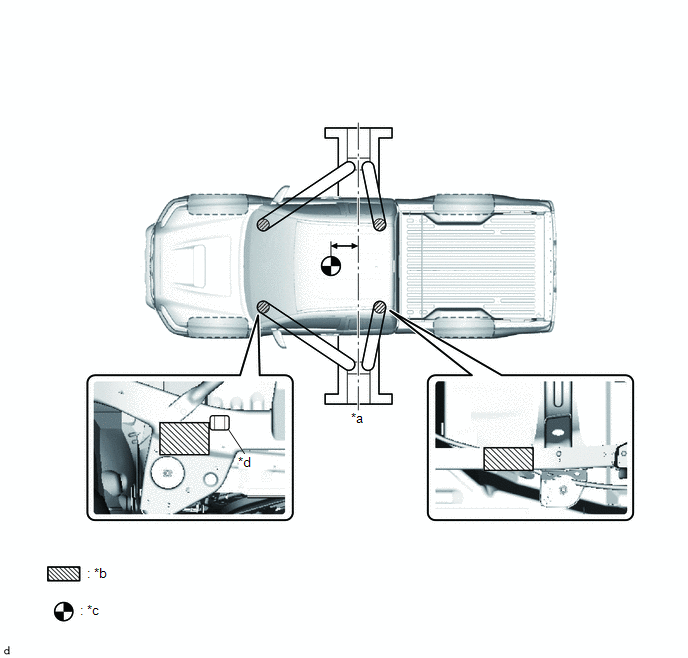 (b) When removing heavy parts such as the engine and transmission, the center of gravity of the vehicle may shift. To stabilize the vehicle, place a balance weight in a location where it will not roll or shift, or use a mission jack to hold the jacking support. (a) Follow the safety procedures outlined in the lift instruction manual. (b) Use precautionary measures to prevent the free wheel beam from damaging tires or wheels. (b) Set the jack and rigid racks to the specified locations of the vehicle accurately. (c) When jacking up the vehicle, first release the parking brake and move the shift lever to N.
(g) It is extremely dangerous to perform any work on a vehicle raised on a jack alone, even for work that can be finished quickly. Rigid racks must be used to support the vehicle. When jacking up the vehicle, make sure the vehicle is not carrying any extra weight. 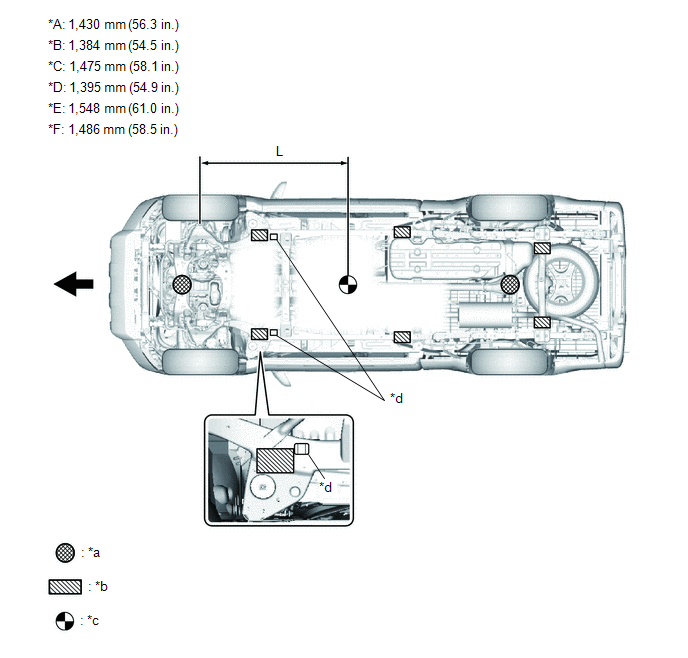 When setting the vehicle on the safety stands, be careful to avoid the resin component (*d) shown in the illustration. (a) Follow safety procedures outlined in its instruction manual. (b) Use a swing arm equipped with a rubber attachment. (d) Place the vehicle horizontally by adjusting the height of the cradle, and match the groove of the cradle and the safety stand support location accurately. (e) Be sure to lock the swing arms before lifting and during work (if equipped with arm locks). (f) Lift the vehicle up off the ground. Stand at a safe distance and shake the vehicle to check its stability. When setting the vehicle on the attachments of the swing arms, be careful to avoid the resin component (*d) shown in the illustration.